He is firmly dedicated to saving people’s lives both in and out of business. Max has been a member of a number of community healthcare institutions over the years and currently sits on the board of directors of Waikiki Health Center. Max believes that a key ingredient to running a successful organization and managing hundreds of employees is to have a common goal and unity in direction. “You start out with a really good mission and a really good set of values and you find some people who believe in those things too and then you just work really hard to achieve your goals, keeping in mind your mission and your values and your vision,” he said. 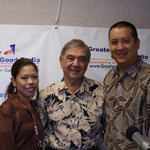 Greater Good Radio brings to you Max Botticelli, president and chief executive officer of University Health Alliance, where he talks about the foundation of UHA and their mission in providing quality healthcare to Hawaiians, especially the disadvantaged. Listen to this interview and find out more. 1985-87	Kellogg Foundation Grant: Primary Health Care Decision Making Project. 1989-91	Project Coordinator, Chair, Writing Committee, Ke Ola O Hawaii. Resulting in Kellogg Foundation Community Partnerships in Medicine Initiative Grant. 1991-1994	Ke Ola O Hawaii, School-Based Health Clinic. Anderson AS and Botticelli MG: Hawaii EMCRO emphasizes continuing education. The Hospital Medical Staff June 1973; 18-24. Markoff RA, Kinzie JD, Botticelli MG and Bolian GC: A simplified guide to the rational use of psychotropic drugs. Hawaii Medical Journal June 1974; 33(6):201-206. Botticelli MG, Anderson AS: MD-level competence in internal medicine: objectives and the flexible clerkship. Arch Intern Med Feb. 1981; 141:235-236. Anderson AS and Botticelli MG: Evaluating M.D.-level competence in internal medicine. Jrnl Med Educ July 1981; 56:587-592. Botticelli MG: A cost-conscious approach to the evaluation of patients with low back pain. Hawaii Medical Journal Dec. 1986; 45(12):447-453. Botticelli MG, Nagoshi MH, Bogden PE, Hew CS: Primary health care decision-making. In: Stemming the rising costs of medical care: answers and antidotes. Battle Creek, Michigan: W.K. Kellogg Foundation; March 1988:33-37. Botticelli MG and Gilbert FI: The Yin and Yang of medical practice. West J Med Jul 1988; 149:108-110. Botticelli MG: Ethics, standards and TQM. Hawaii Medical Journal Apr. 1995; 54:469-471. Anderson AS, Botticelli MG, Worth R: An experiment in non-punitive peer review. Hawaii EMCRO: Final Report, June 1973. 1. Botticelli MG: A way to cut medical costs: accept death. The Honolulu Advertiser, Jan. 23, 1994. 2. Botticelli MG: The high cost of dying. The Honolulu Advertiser, June 11, 1995. 3. Botticelli MG: Affirmative action works. The Honolulu Advertiser, January 4, 1996. 4. Botticelli, MG: Manner of death must be ours to choose. The Honolulu Advertiser, January 12, 1997. 1. “Takayasu’s Arteritis: Report of Two Cases”, presented at the Hawaii Regional Meeting of the American College of Physicians, Honolulu, 21 February 1968. 2. “Peer Review: An Effective Means of Developing Education Objectives and Education Programs”, presented at the Hawaii Regional Meeting of the American College of Physicians, 23 February 1972. 3. Continuing Education Seminar: Continuing Education Institute, Rome, Italy, 9-19 September 1976. 4. Hawaii Medical Association Annual Meeting: “Diabetes Mellitus: Diagnosis and Treatment”, October 1978. 5. Faculty Coordinator, Division of Continuing Education and Conferences, University of Tennessee Center for the Health Sciences Course on “Diabetes: Management and Treatment”, March 1979. 6. American College of Physicians Hawaii Regional Meeting, “Goal Setting and the Cost of Medical Care”, 4-6 February 1980. 7. American College of Physicians Hawaii Regional Meeting, “Teaching Cost Effectiveness: A Review of the Literature”, 23-24 February 1984. 8. Conference on Teaching Internal Medicine: “Providing Continuity in Medical Training Programs”, Johns Hopkins University, 4 December 1985. 9. American College of Physicians Hawaii Regional Meeting, “The Challenge of Primary Care”, 26-27 February 1987. 10. University of Hawaii Department of Medicine Grand Rounds: “Screening for Breast Cancer: The View From Primary Care”, Honolulu, Hawaii, April 7, 1987. 11. Breast Cancer Screening: Benefits & Costs CME Seminar sponsored by the Hawaii Chapter of the American Cancer Society and the Queen’s Medical Center, Honolulu, Hawaii, April 14, 1987. 12. Teaching Internal Medicine Meeting: “The Medical Decision Making Conference: A New Approach”, Philadelphia, Pennsylvania, December 2, 1987. 13. G.N. Wilcox Memorial Hospital Medical Staff Conference: “Breast Cancer Screening: Benefits & Costs”, Lihue, Kauai, April 18, 1988. 14. Teaching in Internal Medicine Meeting (Poster Session): “The Effect of the Systematic Application of Decision Analytic Concepts on the Management of Patients with Sore Throat”, Boston, Massachusetts, November 29, 1989.